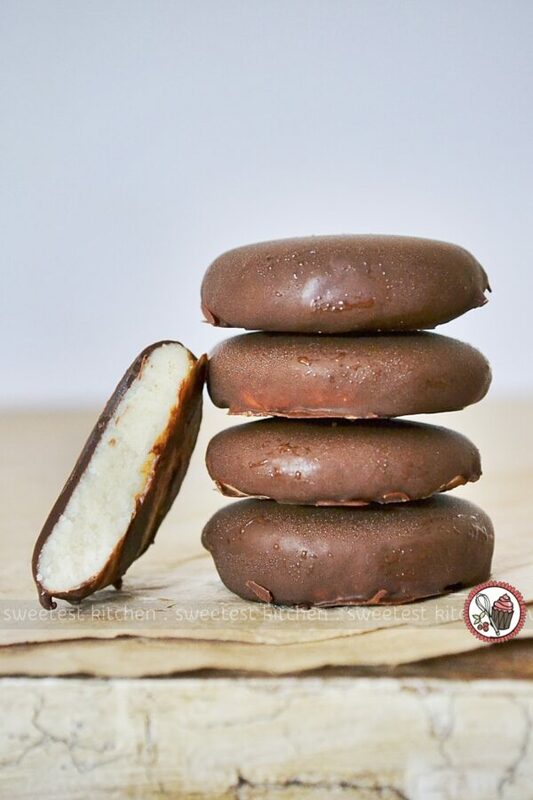 How many of you guys love peppermint patties? I know there are quite a few of you out there, and I don’t blame you – peppermint patties are awesome! That creamy, pepperminty filling coated entirely in crispy chocolate is kind of what dreams are made of. When you buy them at the shops, you know they’re full of pure sugar, which is okay once in a while, of course. But maybe sometimes you might be feeling a bit guilty and you’d like to opt for something healthier. Still pepperminty, but not with all the sugar. I have just the recipe for you, and it’s perfect for those chocolaty-pepperminty cravings. 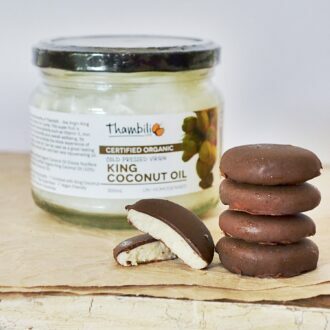 It starts with Thambili Life coconut oil from Sri Lanka. 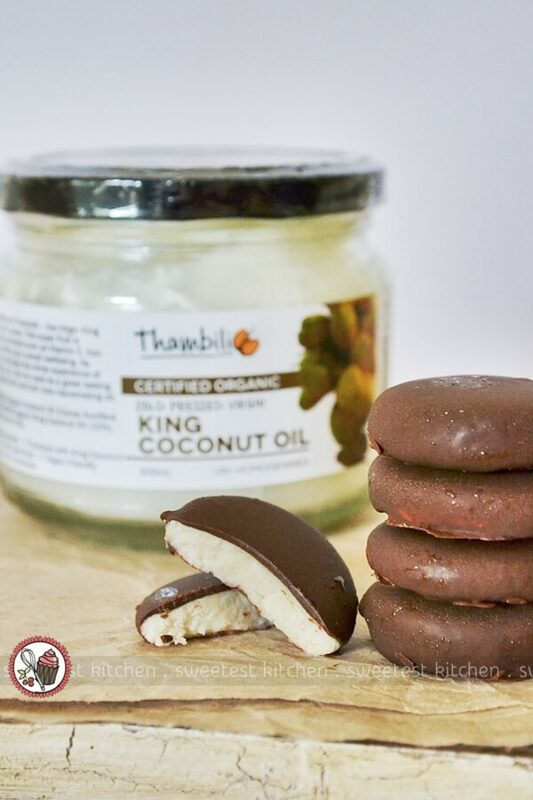 The Thambili Life brand, committed to ethics and quality, source their coconuts from 100% certified organic and sustainable native King coconuts, which provides opportunities for local farmers. King coconut oil is non-GMO, gluten-free and contains no hydrogenated fats. It is also chemical- and hexane-free, making it perfect for high heat cooking. As King coconut oil is full of nutrients, such as vitamin E, iron and calcium, you’ll know that it’s good for the body. You can also easily replace most fats in a recipe with coconut oil and enjoy the benefits of no added cholestrol. I can tell you that coconut oil is great for the hair, as well! I use it often for a bit of shine and softness, and to ease frizz, on the ends of my hair. You only need a small amount, though, or you’ll end up with greasy hair! Back to this recipe, though. The peppermint filling in these cute and tiny patties is made from all healthy ingredients – cashews, coconut oil, maple syrup, almond milk, and of course, peppermint extract. Whipping up this recipe is very easy, but you do need to plan ahead of time, as you’ll need to soak the cashews overnight to soften them up and make them easier to puree. The coating is simply a combination of dark chocolate and coconut oil, sort of like a homemade magic shell. It gives the patties that little bit of crunchy texture that you’re used to with the store-bought version. 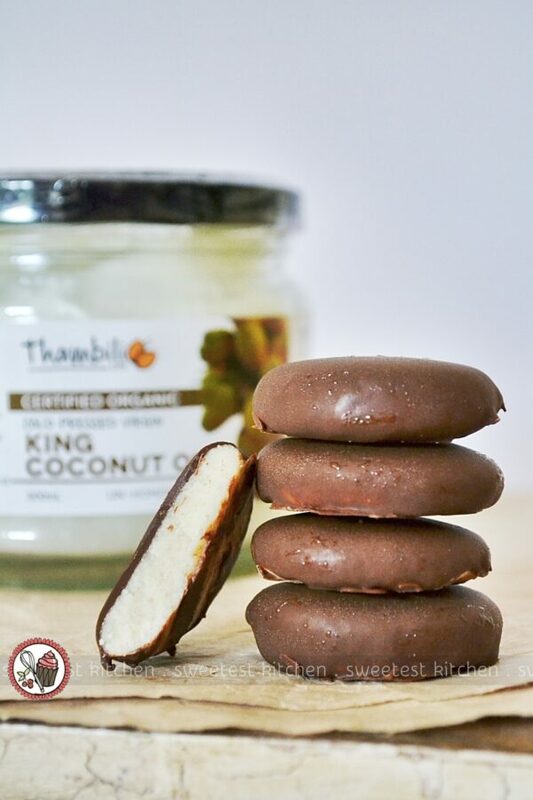 Thambili Life King coconut oil is perfect in this recipe as it seems to be a bit more creamy than other brands of coconut oil I’ve used in the past, and if you serve these patties at room temperature, they are lovely and creamy inside. The taste of the coconut oil is very subtle in this recipe, so you don’t need to worry if you’re one of those people (like me!) who don’t really like a strong coconut oil flavor. You’ll still be able to enjoy these! 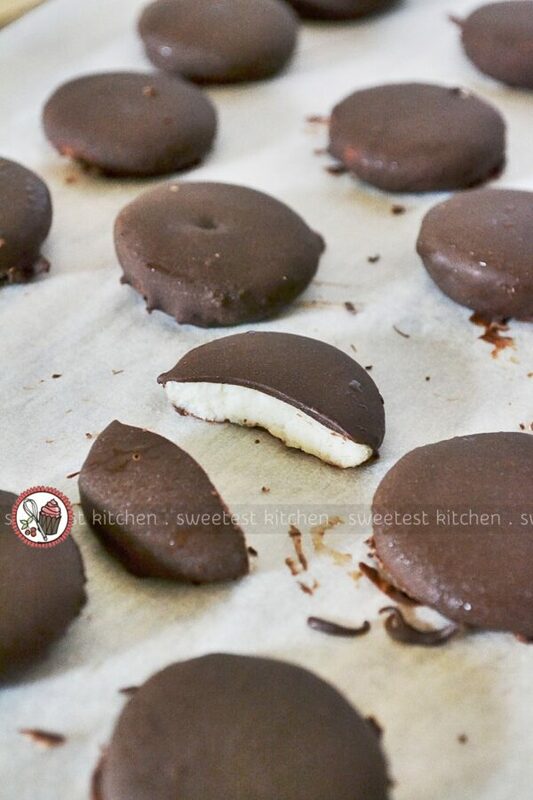 Now, how about that recipe for peppermint patties! 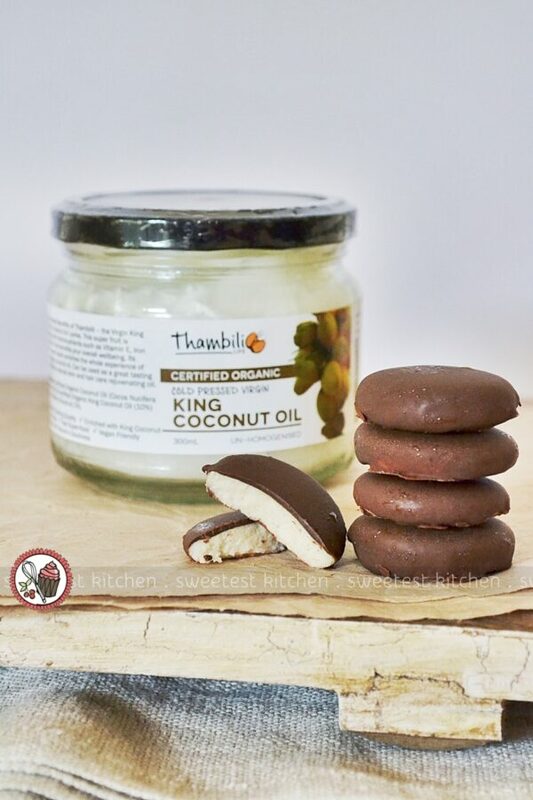 A simple and healthy(ish) recipe for homemade peppermint patties, using 100% certified organic and sustainable King coconut oil from Sri Lanka! 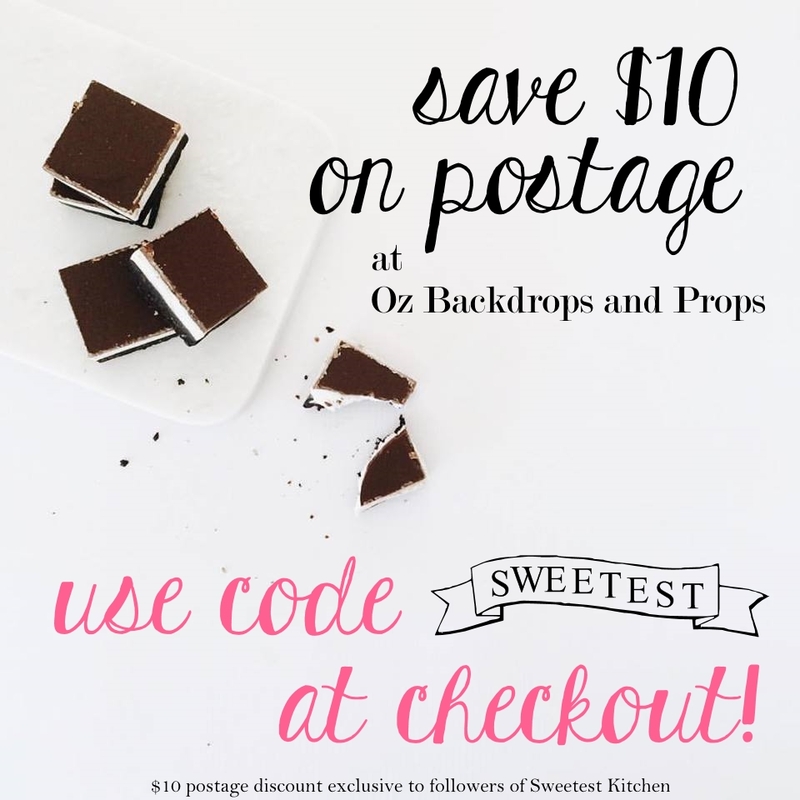 A perfect little anytime treat, with raw, vegan and gluten-free options! Place cashews in a bowl, cover with water and soak overnight. If you're pressed for time and not too concerned about making these raw, you can cover the cashews with boiling water and soak for one hour. Drain and rinse cashews after soaking. Add cashews, coconut oil, maple syrup, almond milk and peppermint extract to a blender. Process on the highest speed to puree until completely smooth (may take a couple of minutes). Taste the mixture and adjust maple syrup and peppermint as you like. Line a 24-hole mini cupcake pan with paper liners (or just place paper liners on a baking tray) and pour ½ tablespoon of peppermint filling into each liner. You should get around 24, but fill more liners as needed. Freeze 30 minutes or until firm. After freezing, unwrap the filling from the liners and set the patties gently on top of the liners (doing this makes it quicker-going when dipping them in the melted chocolate). Place back in the freezer for at least 10 minutes while you prepare the chocolate coating. Melt chocolate and coconut oil together in a heatproof bowl set over a pan of simmering water, stirring occasionally. Cool slightly. Remove the patties from the freezer and, working quickly so the patties won't melt, dip the patties in the chocolate to coat. Tap off excess chocolate and place on a baking paper-lined baking tray. Place the patties back in the freezer to set the chocolate, about 10 minutes. You can easily make this recipe raw, vegan and/or gluten-free by just ensuring you check ingredient labels. You can substitute other milks (cow's milk, coconut milk, etc) for the almond milk, if you're after a nut-free recipe. My melted chocolate started to firm up as I got to the last patties to dip. I'm not exactly sure why this happened, as re-melting the chocolate didn't help. If you find this happens to you, a good suggestion would be to gently reheat it, then transfer it to a ziplock bag (or piping bag), cut a corner tip off the bag, and drizzle the chocolate over the patties. This looks delicious Jamie! I have this great pomegranate black rice salad that I love to make using coconut oil! It’s delish! I have a great recipe for key lime pie using coconut oil. I love to use it in my cakes.